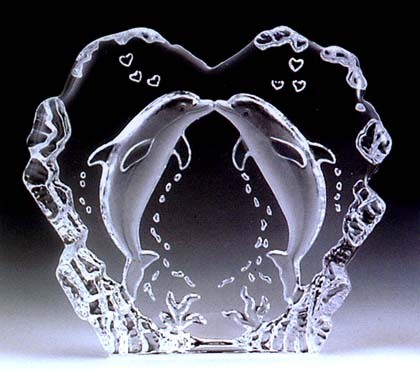 Adorable dolphins celebrate love and beauty in this gorgeous Kissing Dolphins Leaded Crystal Sculpture. Two dolphins meet in the center of this heart shaped sculpture with a tender kiss. Even the air bubbles look like hearts. This 3D illusion art piece can be lit from below for a striking and dramatic visual. This loving art piece makes a perfect wedding cake topper, Valentines day gift, anniversary gift, or a unique and beautiful way to say "I Love You!" to that special someone. Can be lit from below for a stunning effect. Light stands and rotating light stands are available on this page.